Mac's triple pork burger comes with housemade aioli, pickles, onions and slaw on a buttered and toasted Vitale's egg bun. Chris "Mac" McKenzie won't let me in on his secret. I was waiting in line to place my order at his Dogtown cafe, Mac's Local Eats, when I heard a guy ahead of me say something about a "Lumberjack." There was no such item on the menu, but McKenzie called out the order on the sly to his grill cook, who didn't skip a beat. Could I have stumbled onto one of those hidden menus, available only to those in the know? When I got to the window and tried to get in on the fun, however, McKenzie wouldn't budge, offering only a coy shrug. I even caught him bringing out the goods to the gentleman in question; knowing he'd been busted, he gave me a wink and a smile. The man, it seems, is a tough nut to crack. But while McKenzie's steadfastness may be a problem for those of us wanting to join his top-secret eating club, it's also the reason we want to be in it in the first place. For five years, this champion of local eating has been tracking down the area's finest meat and produce as owner of the CSA Mac's Local Buys. Known for his animal shares and grocery bundles, McKenzie is one of the city's biggest champions of high-quality meats, produce and artisan goods. His efforts have resulted in deep relationships with local farmers and purveyors and, in turn, some serious intel on the best-tasting meat in the region. "El Capitan" features no less than four beef patties. 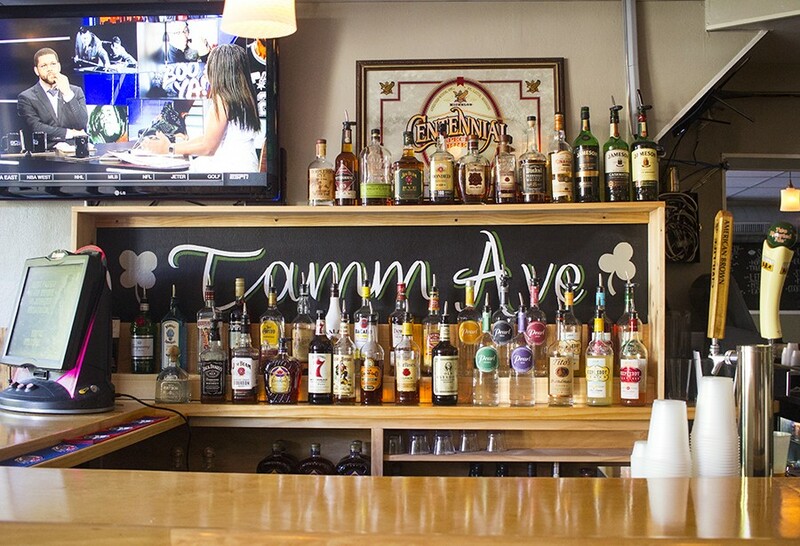 It's no surprise, then, that Tamm Avenue Grill co-owner Bob Brazell recruited McKenzie to run his bar's food program. Brazell bought the place two years ago and had been serving basic bar food ever since. However, when a massive sewer break shuttered the Grill last December, it gave Brazell a chance to run the numbers and reassess the situation. 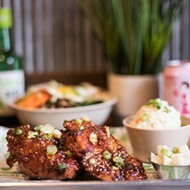 Brazell knew he needed to try something new, but his commitments at Byrd & Barrel (the South Jefferson hangout where he is both owner and chef) as well as Good Fortune (a Chinese-focused concept opening this summer in which he's part-owner) made him wary of taking on the Grill's food program himself. 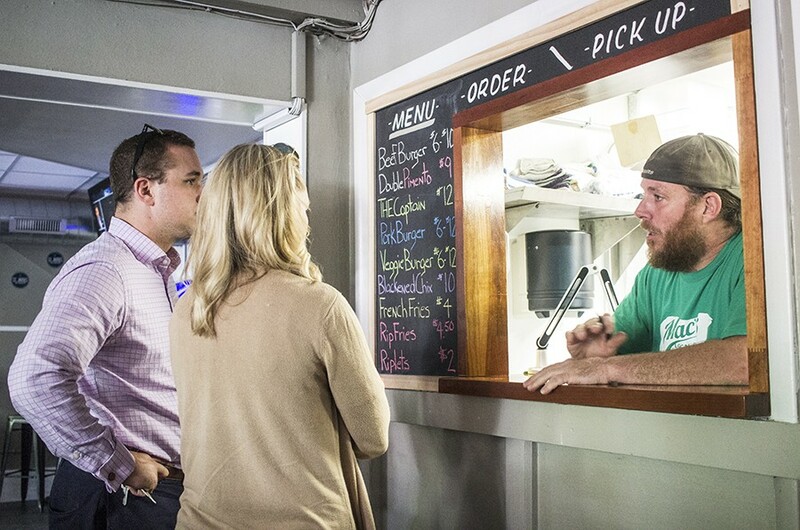 Instead, he came up with the idea of leasing the kitchen to someone who would align with his vision: creative yet accessible fare that would appeal to those wanting to watch the Blues and throw back some beers. Bar food, but damn good bar food. Brazell was chatting with his longtime friend McKenzie about something completely unrelated when it hit him: Why not ask McKenzie to do the food? Because McKenzie knew how to source the best products around, he could offer burgers and fries, but they would be the best burgers and fries possible. Brazell would get the benefit of someone whose vision he trusted running the kitchen, and McKenzie would get to use the Grill, as well as the adjacent storefront, as a physical headquarters for Mac's Local Buys. Customers order at a small window in the rear of the bar. McKenzie partnered up for the project with Bob Komanetsky, who runs the food truck Completely Sauced, and concocted a small but mighty menu. 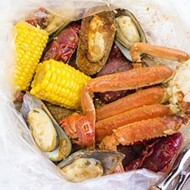 At a glance, the food looks like nothing more than what you'd get at a bowling alley, but a peek under the hood reveals the sort of care you'd get at an upscale, table-service restaurant. 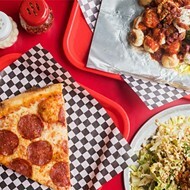 McKenzie and Komanetsky make nearly everything at Mac's Local Eats from scratch, down to the condiments, and the result of their efforts is nothing short of spectacular. The set-up is anything but fine-dining. Mac's Local Eats is located toward the back of the bar's second room, with such a small window for ordering you might pass it by without even knowing it's there. Most of the time, it's a two-man show, with McKenzie working the counter, taking orders and running food while Komanetsky cooks. 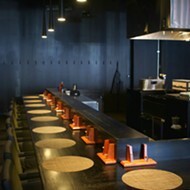 It gets busy, and you'll see them break a sweat, but somehow, your order finds its way to you without much of a wait. Burgers transcend simple bar fare, the result of dry-aging an entire grass-fed, humanely raised cow, and then using every bit of it. 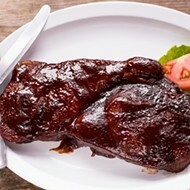 The meat has the deep, hearty flavor of beef in its purist form — glistening but non-greasy, rich-tasting but clean on the palate. There's no secret seasoning blend or sauce; it's just salt, pepper and a quick sear. Mac's burgers are portioned into two-ounce patties and smashed on the flat-top so they get a delectable crispy edge, like the Steak 'N Shake burgers of your dreams. 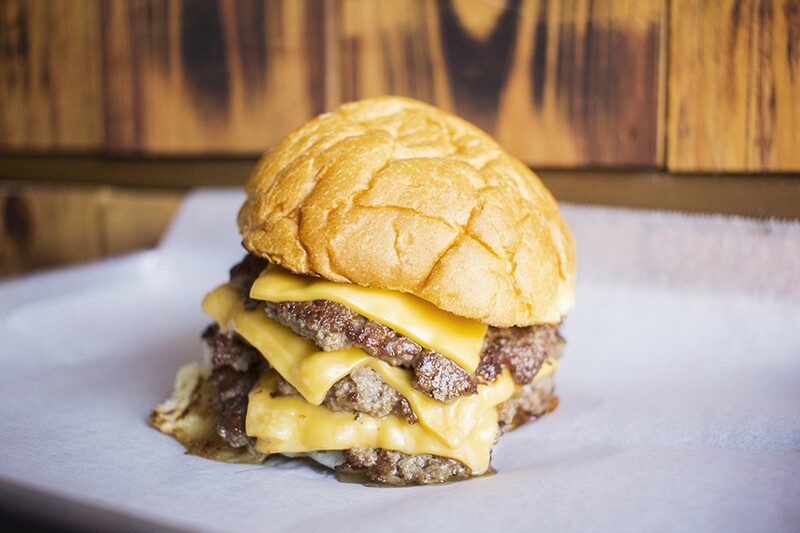 You can stack as many as you'd like onto a bun — one, two, three or, if you're feeling really wild, four. This quadruple monster, known as the "El Capitan," is interspersed with gooey American cheese and dressed with thinly sliced white onions, bread and butter pickles and tomatoes. "Rip fries" are seasoned with Red Hot Riplets seasoning. The "Pimento Double" gives a Southern twist to Mac's burger, pairing the beef with a thick-fried green tomato and luscious pimento cheese. Though the cheese and beef combination is impossibly rich, it's offset by the tang from the tomato and its bread and butter pickles, resulting in a dish that's simultaneously decadent and balanced. Mac's is proficient in more than beef, however, as evidenced by the pork burger. The pork is also painstakingly sourced, freshly ground and formed into two-ounce patties that get the smash-and-sear treatment on the griddle. 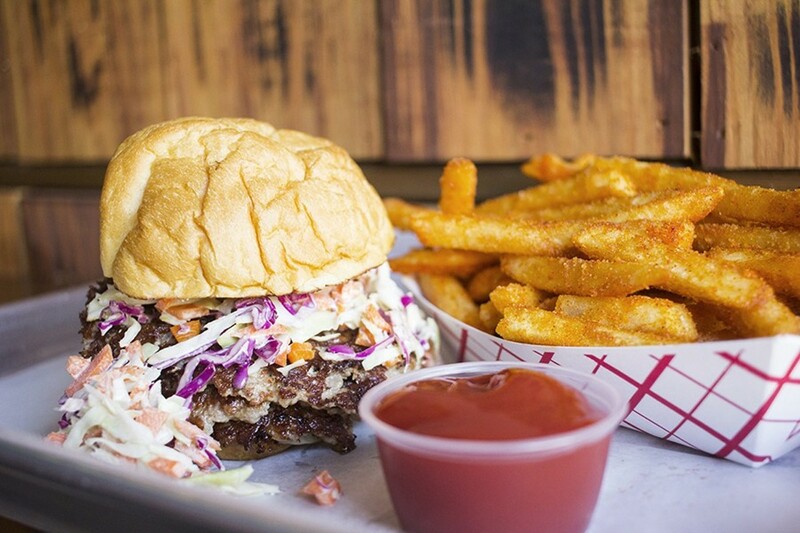 Sweet pickles and slaw add refreshing crunch. Though I'm not usually a fan of meat substitutes, I was impressed with Mac's veggie burger. The crumbly texture and deep umami flavor mimicked the satisfaction of ground beef so impressively that I actually did a double-take, thinking I'd mistakenly bit into the carnivorous version. Clearly, McKenzie's commitment to finding the best purveyors extends beyond meat. 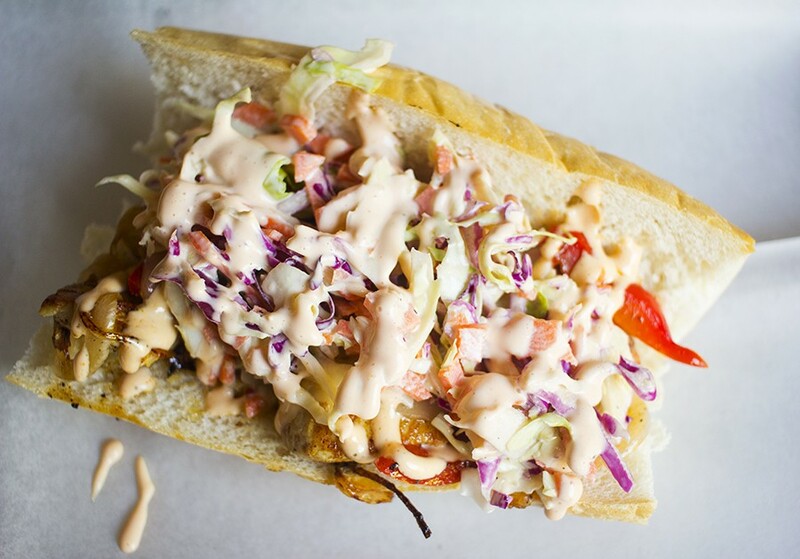 The chicken sandwich is topped with grilled red peppers, cole slaw and housemade hot-sauce aioli on a Vitale's baguette. It's difficult not to order a burger at Mac's, but the "Naked Pig" sandwich may just be the restaurant's best offering. McKenzie and Komantesky sous vide a pork loin with rosemary and garlic, which results in gloriously tender meat. They shave it thin and pile it atop crusty bread, French dip style, finishing it with creamy aioli and a side of pork jus. The meat is so delicate in texture and so vibrantly hued, it's like eating rose petals. No one — not the finest white tablecloth restaurant in town — is serving better pork than this. Mac's Local Eats has a handful of finger foods to go with its sandwiches. Boudin balls, made in-house (of course), are tender, Cajun-seasoned fritters of sausage and rice that are beautifully accented by the accompanying thyme-flecked creamy dipping sauce. French fries are the ideal of the form: medium thickness with a roughed, batter-style exterior, fried to a golden crisp. As a special touch, Mac's will toss them in Old Vienna's Red Hot Riplets seasoning, the tart, hot and subtly sweet blend now sold by the Fenton-based potato chip manufacturer. 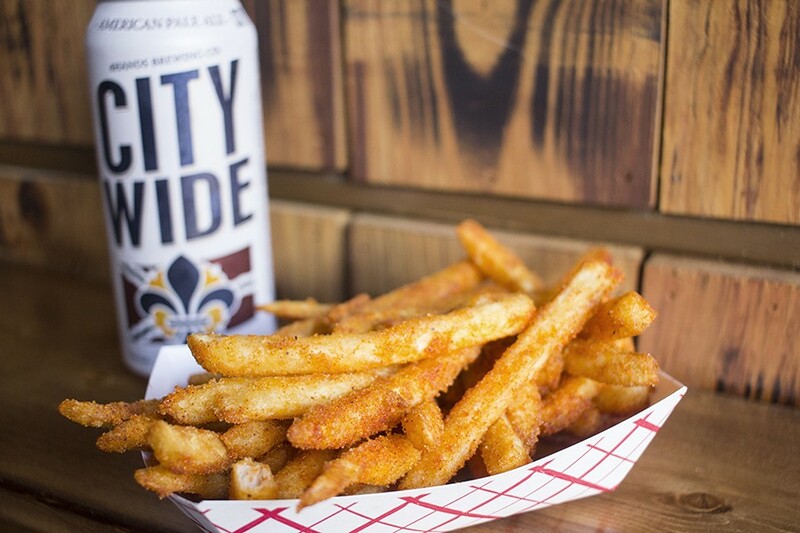 Here, they add a mouthwatering element to the fries that makes them positively addictive. Bob Brazell, who owns the bar, brought in Chris McKenzie to run the food program. If you want to go big, order a side of the creamy bacon and onion dip — a luxurious spread of cream cheese, sour cream, mayonnaise, onions and bacon. Then slather your "rip fries" with the creamy concoction and drift off into euphoria ... which might only be interrupted when the person on the barstool next to you asks what on earth took you into such a state. Don't keep it a secret. In fact, keep nothing about Mac's Local Eats to yourself. Shout out to the entire city that this magnificent little spot is a bastion of simple, yet impeccable food. Something this lovely demands to be shared with every single person you know.